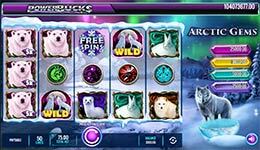 Head out across the frozen plains with a pack of treasure hunting wolves in Arctic Gems Powerbuck$ slot from IGT! The mystical prowess of the northern wilderness is presented on a standard 5x3 slot grid with 50-lines of action. 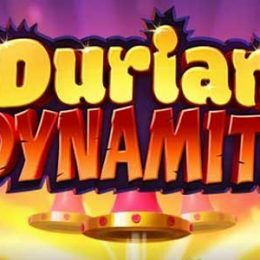 An aurora illuminates the slots background while you spin to try to hit one of the game's bonus features, or one of the jackpot prizes. 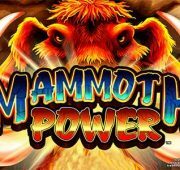 Head out across the frozen plains with a pack of treasure hunting wolves in Arctic Gems Powerbuck$ slot from IGT! The mystical prowess of the northern wilderness is presented on a standard 5×3 slot grid with 50-lines of action. 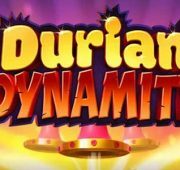 An aurora illuminates the slots background while you spin to try to hit one of the game’s bonus features, or one of the jackpot prizes. 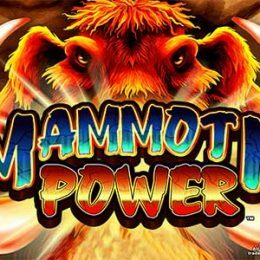 Wild Symbol – The Wild symbol substitutes for all symbols in the game except the snowflake free spins trigger, to complete winning combinations when possible. Free Spins Bonus – Land three snowflake free spins symbols anywhere on reels 1, 3 and 5 to win 8 free spins. Multiplier Feature – If a symbol containing a multiplier appears in a line win, that win is multiplied by 2x, 3x or 5x respectively. Multipliers only appear on reel 1 on one of the four animal symbols. Symbol Replacement Feature – On each base game spin only, reels 2, 3, 4 and 5 contain symbols that transform into one of the animal symbols. All transformed symbol positions transform into the same symbol. 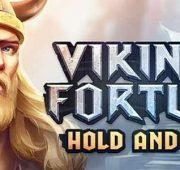 Polar Picks Bonus – The Polar Picks Bonus may be randomly triggered on any base game spin that contains one or more 2x, 3x or 5x on reel 1. 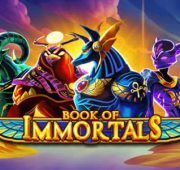 Increase the chance of triggering the Polar Picks Bonus by increasing the bet, up to 300.